In this video, Benjamin Warde provides tips for using the color picker in Lightroom Classic CC. Just posted: Sony FE 100-400mm f/4.5-5.6 GM OSS Lens Review. How does Sony's latest telephoto zoom lens perform? That question is now answered. 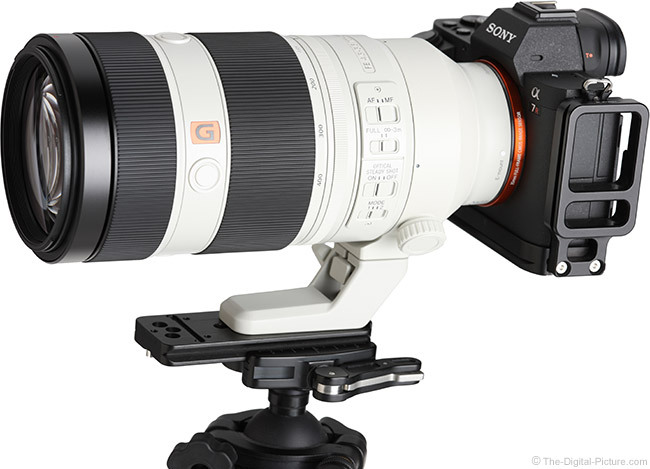 The Sony FE 100-400mm f/4.5-5.6 GM OSS Lens is in stock at B&H | Amazon | Adorama | WEX. Albert Watson’s iconic photographs resonate. Perhaps none more so than this 2006 shot of Steve Jobs which has become a signature image of the late visionary and businessman. I always enjoyed playing sports while growing up, and these days I thoroughly enjoy watching live sports action with a camera in-hand, a situation that perfectly combines my greatest interests. 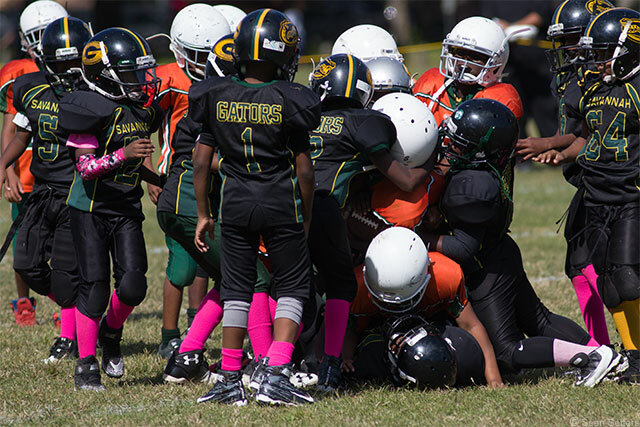 This weekend I decided to take my EOS 7D Mark II (with battery grip), EF 300mm f/4L USM lens and a few business cards to a local park here in Savannah where youth football games are played. While walking around, I tried to photographed pivotal and/or exciting plays to see what I could get. Inevitably, many parents would ask me, "Did you get that last play? If so, where will the images be published and how can I get one?" Getting noticed by players' parents was precisely my goal when setting out, and it started with my choice of gear. Go to any sporting event and you'll likely see a parent (or several parents) taking photos using their mobile phones or otherwise sporting consumer-grade cameras and 18-55mm lenses. As such, simply using a DSLR isn't enough to get noticed by potential clients (and an 18-55mm lens won't likely allow for capturing impressive imagery at such long-field events). However, a gripped DSLR with a big white telephoto lens attached reminds people of the type of gear they see being used along the sidelines of every major pro sports event. Without having shown anyone a picture you've taken, you've already got street cred. And for youth sports events which are often played at public venues (like parks), even a 70-200mm lens can work well in capturing the action (though I find a 300mm lens to be ideal). Of course, you'll have to make good use of your gear to bolster your credibility (practice, practice, practice!). And when a parent asks about where they can find your images, you have a few options. You can either point them to a website gallery tagged with the date/time/team names (for individual sale through services like SmugMug) or you can simply hand them a card and say, "I'm a freelance photographer. If you'd like me to take photos of your child while he plays, my rate is $ ___.00/(hour or game) for a disc of all the images featuring him/her." Otherwise, you could work out a deal for a specific image they previewed on the back of your LCD using PayPal to settle the transaction fee. And speaking of previewing images on the LCD, you may want to carry a hood loupe around your neck so that parents can see glare-free images on your LCD. Want to really grab potential clients' eyes at such events? Here's an idea I've been kicking around for quite some time. Get a custom designed T-shirt that says, "Want action photos of YOUR athlete? Call 555-555-5555!" This type of advertising will be easier than handing out a bunch of business cards and will likely lead to even more sales. Keep in mind, I'm talking about photographing youth sports that have been organized under a public league program and are not tied to a specific school or academic conference. Note that some schools and organizations may have an exclusive contract with an official photographer or may otherwise prohibit freelance sales at such events. A quick check with the event’s organizer can quickly discern this matter. If you love sports and already have a big white telephoto lens in your kit, then shooting youth sports events is a fun way to make extra income on the weekends while doing what you love. Noise test results have been added to the Canon EOS M100 page. With their current top-of-the-line 24 MP APS-C imaging sensor, Canon has been making full use of economies of scale. This sensor is now featured in a large and growing number of DSLR and MILC cameras, ranging from higher-end models down to the bargain-low-cost M100. Are there any differences between models from an image quality perspective? The Canon EOS M100 vs. M5 comparison will shed some light on this answer. 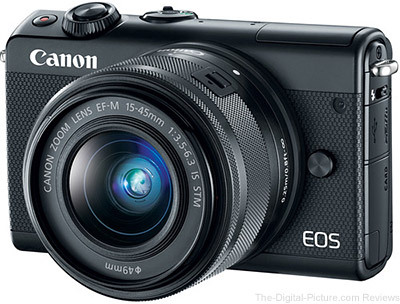 The Canon EOS M100 is in stock at B&H | Amazon | Adorama | WEX (preorder). From Oct 29 2017 - Jan 6, 2018, purchase and register the products listed below and receive 13 months of accident protection from drops, spills & more! For further details, visit usa.canon.com/protection. Nikon Imaging (China) Co., Ltd. (NIC) was established in June, 2002 in Wuxi City, Jiangsu Province, China, and manufactured digital cameras and lens units for digital cameras. In recent years, however, due to the rise of smartphones, the compact digital camera market has been shrinking rapidly, leading to a significant decrease in operating rate at NIC and creating a difficult business environment. As part of restructuring the Imaging Products Business, the Company will focus more on high value-add products. China’s position as one of the most important markets in the world will remain unchanged. Nikon Imaging (China) Sales Co., Ltd. (NICS), the Company’s sales subsidiary in Shanghai, continues in full operation as normal, contributes to photo and imaging culture development, and strengthens the sales effort of imaging products and the after-sale services in China that meet customers’ satisfaction. For more information, check out the full press release (.PDF). NORTH WHITE PLAINS, N.Y. – OCTOBER 26, 2017 – X-Rite Incorporated, the world leader in color management and measurement technologies announces the i1Studio, an all new start-to-finish color management solution that delivers expert results from capture through to print. The i1Studio enables exceptional color accuracy for photographers, filmmakers and designers of all levels to achieve consistent and predictable results across their workflow – saving time and money. The package comprises the i1Studio all-in-one spectrophotometer, i1Studio software, X-Rite’s market leading ColorChecker camera calibration tools and the ColorTRUE mobile app. “Photographers tell stories with their pictures. Along with light, color plays an essential role in telling these stories. We want to make sure that your story is told as perfectly as possible, whether it’s color or black and white. Managing color should be easy with getting accurate repeatable results every time as the ultimate goal. i1Studio provides an intuitive, start-to-finish color management solution for every device in our users’ workflow so they can easily achieve this goal and get amazing results.” Liz Quinlisk, Marketing Director Photo & Video, X-Rite. Amongst its wide array of features, i1Studio includes dedicated profiling for Black & White prints, scanners, mobile devices and video monitors. The new i1Studio software is engineered on the same platform as X-Rite’s i1Profiler, offering a streamlined user experience with the perfect balance of automation and creative controls. This gives users more options and more control, while delivering prints perfectly matched to their creative vision. X-Rite's i1 Studio is now available through our global reseller network and on xritephoto.com, xritephoto.eu and xrite.com. B&H has X-rite i1Studio available for preorder. 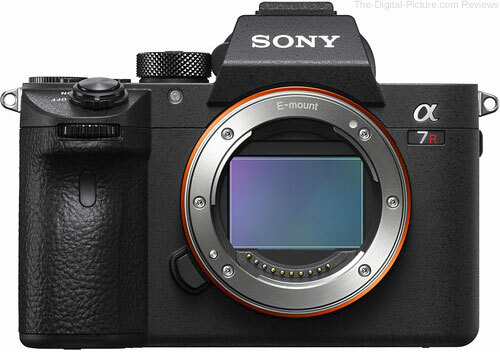 A rented Sony a7S II was dead on arrival when it was returned to LensRentals, so Roger Cicala and his crew (Aaron) disassembled the camera to find out why. Their disassembly demonstrates what can happen when even a "weather resistant" camera is subjected to corrosive sea water. Check out the LensRentals Blog post for the complete teardown. Our Airport Advantage roller, which is designed to hold the maximum amount of gear that will fit in overhead bins or under seats on commuter or regional jets, was named “Best Camera Bag” by the judges of the 2017 Lucie Technical Awards. The Lucie Technical Awards honor large and small companies, as well as the individuals who have advanced the photographic industry in a given year. Think Tank Photo has the Airport Advantage rolling camera bag in stock. I have a Canon EOS M100 in my hands and it is time to set up the camera for use. Following are the 25 steps I took to make an out-of-the-box M100 ready for use. Open the box, find the battery, place it in the charger and plug it in. While the battery is charging, unpack the other items you want from the box. This is a good time to install the neck strap. Download and install the Canon Solution Disk software on your computer to get support for the latest camera(s). Canon Digital Photo Pro (DPP), EOS Utility, Photostitch and Lens Registration Utility are the options I manually include in the install. Insert the battery (after charging completes) and power the camera on. The date, time and time zone setup screen will show at the first startup. Use the Rear Control dial and Set button to update this information. Insert a memory card (don't forget to format the card via the tools menu option before taking pictures). If the lens being used retracts beyond a usable focal length (the EF-M 15-45 for example), unlock and extend the lens. Set the camera's mode to Av, Tv or M (some modes provide only a small subset of available menu options). Use the middle switch setting (Creative Assist by default) and scroll up to the advanced modes. Shooting Menu, Tab 1: Image quality: Use top dial to set RAW to "RAW" and Rear Control arrow (press left or right) to set JPEG to "-"
Shooting Menu, Tab 6: High speed NR: Off (or Low) (Noise reduction is destructive to images details - I prefer to add NR sparingly in post. Select "Low" if shooting in JPG format). Exit the menu, press the playback button and press the Menu button. I make other menu and setting changes based on current shooting scenarios, but this list covers my initial camera setup process. To copy this configuration would mean that you intend to shoot similar to how I shoot - including shooting in RAW-only format. While my setup works great for me, your best use of this list may be for tweaking your own setup. B&H carries Adobe Photoshop Lightroom 6. B&H carries DJI Care Refresh coverage.